Oh, how we do look forward to our Advent celebration every year. This year, regrettably (?) we haven't put much time and effort into planning it out as we are doing a whole lot of coming and going (with a myriad of guests coming and going as well). It feels much more hectic and so instead of planning a bunch of activities and whatnot, we're just kind of taking things one day at a time. I think this is best for us, for now. I had to check in with Jonathan to see what he thought of the book, since he's the one going through it with the kids. He said it's excellent for their ages: 6, 4 and 1. The oldest has enough "meat" from the story to chew on, the middle child is listening to the story again and the youngest is memorizing songs which tell the story of our Savior's birth. He said the kids have been paying attention to the book and that it's just the right length to hold their attention. A few years back I wrote up a post talking about two other advent books which we were familiar with. We hadn't found any others to use with toddlers so we were very pleased to receive Why Christmas? for review purposes from Shepherd Press. It is proving to be a great devotional for the month of December - the season of Advent - for toddlers. We're very thankful for the use of it this year and will likely be pulling it out again over the course of the next few years, for our younger children in particular. As mentioned, we received this book from Shepherd Press in exchange for our honest thoughts. Our honest thoughts are that if you have young children in your home, you'll probably want to check into this one! Additional side note: Annette at This Simple Home briefly mentioned this book in her post about how she and her family are celebrating Christmas daily in December. For some more ideas of how to celebrate the season with your kids, check out Annette's post! We're also having a busy unplanned Christmas season. I've been looking for an Advent devotional book to do with our kids (next year) and not finding one I like. This one might work for us. It's good to know that it not only looks good, but is also working well for your family!! I am looking forward to reading it next year. I really wanted to this year, but do think it wise to not have yet another daily thing we "must" do. 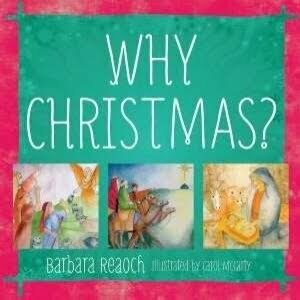 I had not heard of this one, but I'm always interested in books that focus on the real meaning of the season! Thanks for the recommendation. This does sound like a wonderful resource, especially for younger kids. Cute! I feel like Christmas just flew by (again!) this year. I'm catching up on all my blogs now.